From March 17 to 20, the fifth annual Korean American Film Festival New York (KAFFNY) will screen a strong crop of shorts and feature-length movies. But in what sense are all these films “Korean American”? Most but not all were created by Korean Americans. Some deal with ostensibly Korean American diasporic subjects. Others are straight-up Korean, that is, foreign, films. Fortunately, as long as the films are good, none of this really matters. This year’s KAFFNY is strongest in documentaries, mostly due to its retrospective filmography of Dai Sil Kim-Gibson (pictured above). I’m a fan of her movie (and book) on the Korean comfort women, Silence Broken, but look out for her two documentaries on the L.A. Riots, Sa-I-Gu and Wet Sand. On Saturday, March 19, in conjunction with the screenings, Kim-Gibson, collaborator Charles Burnett (creator of the legendary 1977 film Killer of Sheep), and the mother of a Korean American teenager killed during the Riots will discuss the impact of that 1992 violence. I’m also excited for The House of Suh, Iris Kim’s documentary about a brother who murders his sister’s fiancé at her bidding. In terms of narrative features, I recommend Kim Young Nam’s The Boat, a Korean-Japanese gangster film with a touch of sweetness, and Peter Bo Rappmund’s psychohydrography (pictured above), which uses new photographic methods to trace California water from mountain to sea. Joan Didion would be proud. Just before Rappmund’s film, on opening night, DJ Spooky, Okkyung Lee, and Sean Lee will live-score the early Korean film Madame Freedom. KAFFNY has lined up about two dozen short films, some as part of a shorts competition. I love the abstract animation Heart, by Erick Oh (funded in part by The Simpsons’ Matt Groening), in which shape-shifting figures wrangle for an elusive pink heart, their movements set to a contemporary classical score. The autobiographical art-short Daddy Called Me A Snake, by Sun Young Kim, is as rhythmic and riveting as a Heavy Industries piece, even as it tells a disastrous family history. Also check out Jung Chul’s Apple, a comic, bathetic glimpse at the symbiosis between a Korean housewife and her 20-something stepdaughter. 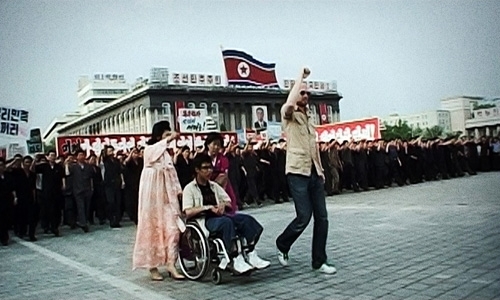 The enigma of North Korea comes to the festival via three very different movies. The first, Centre Forward, a soccer-themed classic from 1978, is double-billed with Red Chapel (pictured above), the Sundance winner about three Danish comedians' sojourn to North Korea -- à la Ali G. KAFFNY will also screen John Arlotto’s short Deface, featuring James Kyson Lee of Heroes, which tells the story of a North Korean factory worker who rages against the regime by vandalizing propaganda posters. Find KAFFNY at the Chelsea Clearview Cinemas, with additional events at White Box gallery on the Lower East Side. Susie Lim, who co-directs both the festival and White Box, says, "We’re excited to show films in a gallery space as well as the theater. We’re creating a platform that doesn’t exist, for fine artists as well as filmmakers." Read more about What Makes a Film Korean American? I would like to vote that the total screen-time occupied by the total number of Koreans in the final cut of the film should be longer than any other ethnicity to make it a Korean American film!